The outstanding Tessitori Duo of Isobel Leirera, viola, and Jaoa, classical guitar, visited the island through the support of the Jersey Arts Trust. 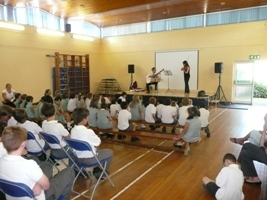 During their visit they performed for Key Stage 2 children at Springfield School, exploring each of the different Spanish characters in Manuella De Falla’s entertaining Spanish Dances. They completed their tour with a concert at the academy, in which, amongst other works, they performed Schubert’s ‘Arpeggione’ Sonata, originally for viola and piano but equally musicially convincing in this arrangement for viola and guitar.